The next poise is that of the tertiary poise of the Supermind. The secondary poise of the Supermind had modified the inalienable unity of the primary poise so as to support the play of Many in One and One in Many. The tertiary poise modifies this movement further so as to support the manifestation of the diversified individuality. In other words, once the fulcrum of support of the individual form as the soul-essence or Jivatman is established in the poise of the secondary Supermind, the forms supported by the Jivatman start moving to unique differentiations. Variations develop as a play and phenomenon of the principle of unity. The secondary and tertiary poises of the Supermind develop and apply in the terms of Divine Multiplicity what the primary Supermind had held in the terms of the Divine Unity (The Life Divine, pg 161). Thus the in-built program of creation that exists as an essence in the primary poise of the Supermind starts getting actualized in the secondary and tertiary poises of the Supermind. To have this process initiated, the triune unity of Sachchidananda (the principle of Existence ---- Consciousness-Force – Bliss) begins to get delinked and differentiated. Consciousness and Force, which were intertwined with each other, differentiate into the twin aspects of Knowledge and Will – the twin aspects of the pure power of Existence. In the secondary poise of the Supermind, the differentiation of Knowledge and Will begins but is not total as there is a link with each other and with the principles of Existence and Bliss. This link is initially essential as the in-built program of creation must carry simultaneously Knowledge and Will so that what has been ‘conceptualized’ can be automatically ‘actualized’. Thus the movement of the creative principle towards its perfect execution without getting lost in the chaos of infinite possibilities follows a Divine Law which is ‘an inevitable self-development of the truth of the thing that is, as Idea, in the very essence of what is developed, it is a previously fixed determination of relative movements out of the stuff of infinite possibility. 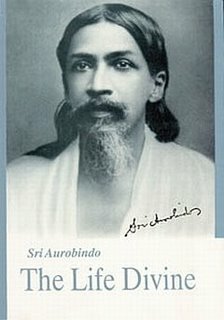 ‘That which thus develops all things must be a Knowledge-Will or Conscious-Force; for all manifestation of universe is a play of the Conscious-Force which is the essential nature of existence. But the developing Knowledge-Will cannot be mental; for mind does not know, possess or govern this Law, but is governed by it, is one of its results, moves in the phenomena of the self-development and not at its root, observes as divided things the results of the development and strives in vain to arrive at their source and reality. Moreover this Knowledge-Will which develops all must be in possession of that unity, it has only an imperfect possession of a part of the multiplicity. ‘Therefore there must be a principle superior to the Mind which satisfies the conditions in which Mind fails. No doubt, it is Sachchidananda itself that is this principle, but Sachchidananda not resting in its pure infinite, invariable consciousness, but proceeding out of this primal poise, or rather upon it as a base and in it as a continent, into a movement which is its form of Energy and instrument of cosmic creation. Consciousness and Force are the twin essential aspects of the pure Power of existence; Knowledge and Will must therefore be the form which that Power takes in creating a world of relations in the extension of Time and Space. This Knowledge and this Will must be one, infinite, all-embracing, all-possessing, all-forming, holding eternally in itself that which it casts into movement and form. The Supermind then is Being moving out into a determinative self-knowledge which perceives certain truths of itself and wills to realize them in a temporal and spatial extension of its own timeless and spaceless existence. Whatever is in its own being, takes form as self-knowledge, as truth-Consciousness, as Real-Idea, and, that self-knowledge being also self-force, fulfils or realizes itself inevitably in Time and Space’ (Ibid, pg 156-157).